Cycling helmets can be a divisive subject and even those that do think they have benefits, aren’t necessarily comfortable wearing them. This is particularly true for casual or “urban” cyclists and short distance commuters. 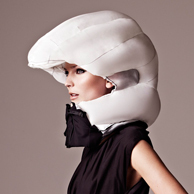 Two young designers in Sweden shared a dislike of cycle helmets, but still wanted head protection. This led them to invent something they think will revolutionise how we protect our heads on a bike. Anna Haupt and Terese Alstin were Industrial Design students who reacted to the possibility of a legal requirement to wear a cycle helmet as an opportunity to do something different. Cycling is more prevalent in Sweden, but helmets are not popular. Anna and Terese decided to see if they could apply their design skills to come up with a new solution – one more suited to urban cycling. Their answer was a “scarf” containing and airbag that detects when the wearer is in a crash situation and inflates a protective helmet shaped airbag over the head. It almost sounds like science fiction and is certainly an innovative approach to the problem that hasn’t been tried before. The design is now in production and in mass production. 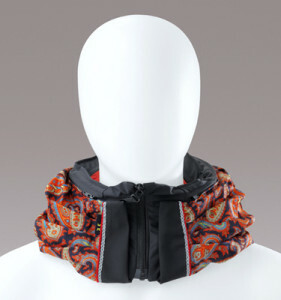 The product looks really good and could encourage people who won’t wear a helmet to still protect themselves. Already popular in Scandinavia there aren’t actually any UK dealers yet, but you can buy direct from Hövding with free shipping to the UK. Any drawbacks? Well this is a new technology with many more components than a piece of moulded foam. And that costs – €399 to be precise. Now that’s the price of a bike and essentially the device is a single use (like a helmet, but much more expensive to replace). So at the moment you have to be really anti helmet and pro-protection (or just rich!) to want one of these, but hopefully the price will come down as it becomes a bit more mainstream. I’d like it to succeed, as its a brilliant idea and as a father of a child with brain damage, the more people do to protect their heads the better in my opinion. UPDATE – the price has now dropped to €299, which is a great improvement. Hopefully it will drop further in future, as popularity increases.